Remember how I said before I’m kind of an idiot? Well, I’m kind of an idiot. There’s no way I’ll have time to finish Bubblegum-Man #1 in time for Atlanta Comic Con. I’ll still be attending, but I’ll be freebie-free. Here’s the new plan: Bubblegum-Man is now slated for the summer of 2014. By then, I should have two or three issues done, and I’ll be all set to hand out copies at conventions. Provided, of course, the convention people don’t mind me handing out free stuff to people. I’m not sure what the rules are. 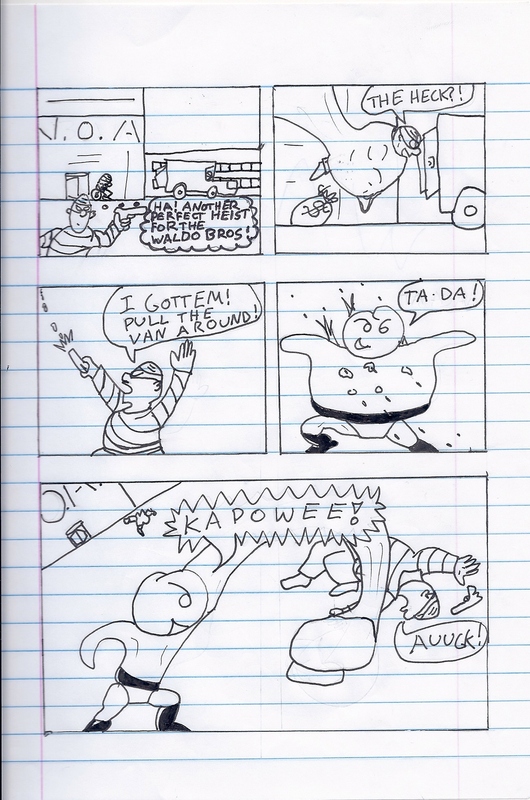 Oh, and I did I mention I’m making these comics available for free to you, my adoring public? Cuz I totally am. So come to Atlanta Con and Dragon Con next summer for your free Bubblegum-Man! For the last five to seven years or so, I’ve been working on my first novel “The Emerald Sword.” It’s a fantasy that takes place in a world populated by knights, ladies, Spanish-speaking elves, wild buffalo, and untamed gods. It’s a wild, beautiful world filled with danger and drinking. Terrwyn Cornraker, a young farmer’s daughter, sets out on a quest to rescue her family from the clutches of an evil sorcerer and his army of skeletons. Along the way, she meets a blue wizard, a shape-shifting wise-crack, and a real, honest-to-gods princess with her own degree. Things really heat up when she receives the Emerald Sword, Zamurrad, the holy blade of the moon goddess Vora. With Zamurrad in hand, she and her friends go off on an amazing adventure high over the mountains and deep into the treacherous forest of fairies and the even-more treacherous streets of Uto, shining city of the north. I’m hoping to make “The Emerald Sword” the first in a series of five books, though it might end up a trilogy or quartet instead. Each book would feature on a particular wielder of the Emerald Sword, including the immortal empress Ayesha Khan. I’ve got ideas for the next two books and enough back-story to shake a long stick at. Well, I sent off my first query letter for “The Emerald Sword” last week and received my first rejection. So exciting! I’ll be sending out more query letters this week. Bubblegum-Man #1 should be coming out in time for the July 7th Atlanta Comic Convention and possible Dragon Con appearance. All that, and Pacific Rim. Man, what a summer! I’ve finished the final draft of my novel! Hooray! Time to start seeking agents. Also, Conq Enterprises now has its own domain here at williambrust.com! We are up and running…sort of. There’s still a few kinks that need to be hammered out. Time to grab my comically over-sized wrench and get to work.